The Language, Literacy and Culture Doctoral Program, Modern Languages, Linguistics & Intercultural Communication department and Global Studies program are sponsoring a lecture and discussion with Sonia Ines Goéz Orrego, executive director of CEDECIS, on March 6 from noon-1 p.m. in Sherman Hall, Room 150. 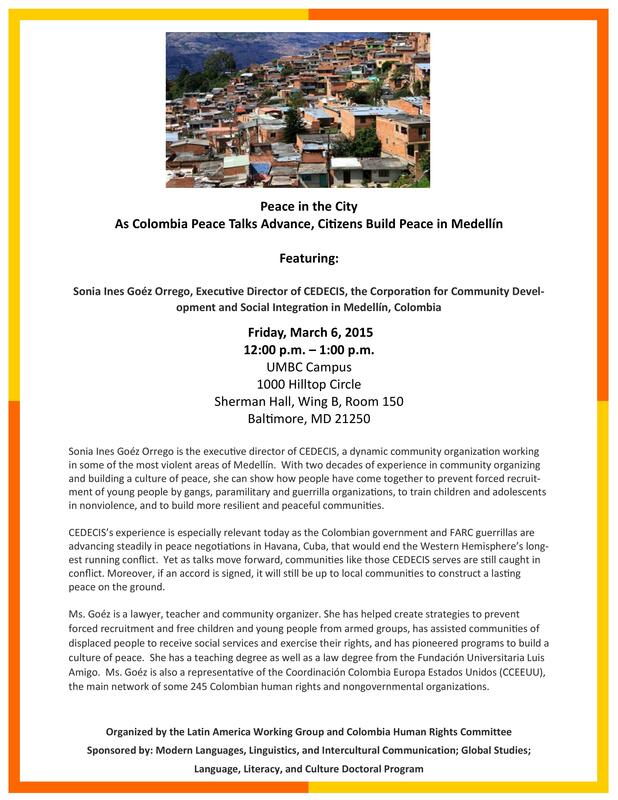 CEDECIS is a dynamic community organization working in some of the most violent areas of Medellín (Colombia). With two decades of experience in community organizing and building a culture of peace, she can show how people have come together to prevent forced recruitment of young people by gangs, paramilitary and guerrilla organizations, to train children and adolescents in nonviolence, and to build more resilient and peaceful communities. CEDECIS’s experience is especially relevant today as the Colombian government and FARC guerrillas are advancing steadily in peace negotiations in Havana, Cuba, that would end the Western Hemisphere’s longest running conflict. Yet as talks move forward, communities like those CEDECIS serves are still caught in conflict. Moreover, if an accord is signed, it will still be up to local communities to construct a lasting peace on the ground. Ms. Goéz is a lawyer, teacher and community organizer. She has helped create strategies to prevent forced recruitment and free children and young people from armed groups, has assisted communities of displaced people to receive social services and exercise their rights, and has pioneered programs to build a culture of peace. She has a teaching degree as well as a law degree from the Fundación Universitaria Luis Amigo. Ms. Goéz is also a representative of the Coordinación Colombia Europa Estados Unidos (CCEEUU), the main network of some 245 Colombian human rights and nongovernmental organizations. This event is organized by the Latin America Working Group and Colombia Human Rights Committee.